Negligent or crooked lawyers in Scotland can be thankful for at least two weapons in their defence against complaints when a client realises they were ripped off. 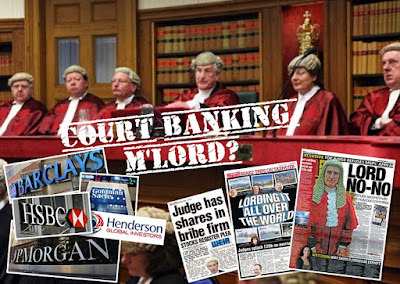 The first weapon in a dishonest lawyers arsenal against such a complaint, would be the Law Society of Scotland, the legal profession's well known self regulator of complaints against solicitors, who act only as a control point to ensure their members are unaffected by even the largest client frauds, poorest levels of service, and in some cases, criminal charges. The second, perhaps more sinister weapon a crooked lawyer can always seem to rely upon, no matter how crooked they are, is, Douglas Mill, the Law Society's very own Chief Executive of now more than ten years. 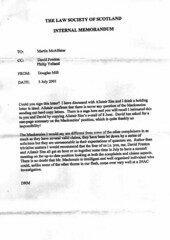 Douglas Mill, a man who last year threatened both the Scottish Executive & Scottish Parliament that if it did not do as he said, he would take it to court on his own insistence that it was a lawyers 'human right' under ECHR to regulate & control complaints against legal colleagues, has a long and consistent record of intervening in complaints and financial claims made against fellow solicitors, with the sole determination to prevent success at all costs. 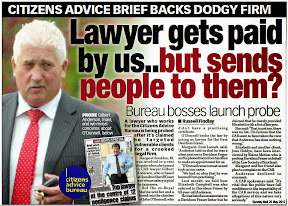 While the law clearly does not allow the Law Society and it's officials to intervene in financial claims against crooked solicitors, Douglas Mill has established a regular policy to do just that - prevent successful client claims against the legal profession at all costs, and intervene at-will in complaints against solicitors to guard against the possibility of a claim after a complaints investigation finds a solicitor guilty of poor service or conduct offences towards their client. Douglas Mill has used the Law Society's policy of consistent intervention in both complaints and financial claims against solicitors many times, and continues to do so unashamedly, in an unrivalled anti consumer, prejudiced, and corrupt policy of ensuring that self regulation of solicitors in Scotland means no regulation of solicitors in Scotland. 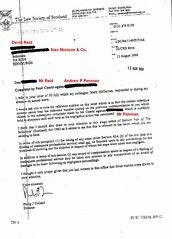 During the Justice 2 Committee hearings on the now passed Legal Profession & Legal Aid (Scotland) Act 2007, an act I would remind you all the Scottish Conservatives tried to stop on behalf of the Law Society of Scotland, Douglas Mill was brought before the Justice 2 Committee to explain his involvement in cases of complaint & financial claims against solicitors. Douglas Mill explained to the Justice 2 Committee he had no such involvement, and as you can see from the earlier except from those Committee hearings, swore on oath and on his 'granny's grave' he had never intervened in such a case. Douglas Mill swore on his 'granny's grave' he was a liar ? However, the Cabinet Secretary for Business, John Swinney MSP, has a different view of matters, which was revealed at that same Committee hearing, when Mr Swinney revealed a secret memo penned by Douglas Mill himself, seeking to intervene & collate information on claims made by Mr Swinney's constituent, Mr Stewart MacKenzie, in a case which has lasted now 22 years and still remains to be resolved to this day. 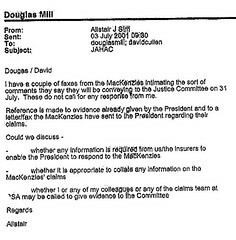 There is little doubt from the evidence of Douglas Mill's own memos in the MacKenzie case, that a concerted & determined policy of intervention in financial claims against lawyers has existed at the Law Society of Scotland for many years, and has been widely successful in protecting a great number of crooked lawyers and the legal profession's insurance scheme from paying out huge damages awards. I have of course, felt the wrath of Douglas Mill's direct intervention in my own case against crooked lawyer Andrew Penman, where Mr Mill even felt so spiteful & protective of his crooked colleague, he had to personally intervene in my claim for civil legal aid to pursue Mr Penman and the Law Society for damages over Mr Penman's plundering of my family's assets. 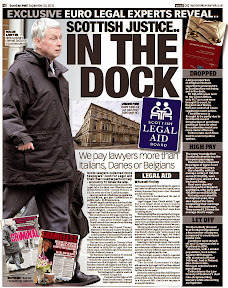 It was simply not in the interests of Douglas Mill, the Law Society of Scotland, and Mr Penman, that I be allowed access to justice or legal services, so they made sure the door was closed on my legal aid funding. 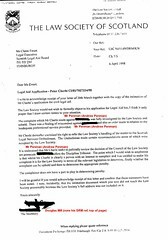 Not content with ensuring I had no access to justice or legal services, Douglas Mill dispatched Mr Philip Yelland, the Law Society's Director of Regulation, to order my own solicitors not to take instructions from me in any case I wanted to raise against crooked lawyer Andrew Penman or the Law Society itself. We are left with no doubt after reading the above, that Douglas Mill and indeed the Law Society of Scotland, operate a concerted policy of intervention against client complaints against solicitors and financial claims for damages, to the point that it is their unashamed policy to ensure complaints against solicitors, and claims for compensation as a result of negligence, dishonest, or other malpractice are obstructed to ensure no success whatsoever and that anyone who tries to raise such a case, or challenges the point of view of the Law Society of Scotland has their right of access to justice, access to the courts & access to legal services denied. 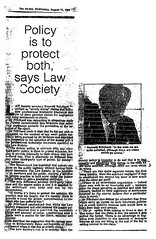 Douglas Mill and the Law Society of Scotland's intervention against client complaints & financial claims against solicitors doesn't stop there though, and reeling from the Scotsman's coverage of my battle with the Law Society in the 1990s over crooked lawyer Andrew Penman, Douglas Mill and others at the Law Society have on several occasions in a now regular policy of intervention with the media, called up newspapers & journalists even in person, to censor newspaper articles before publication and even threaten journalists careers. John Swinney, the Cabinet Secretary for Business in the SNP's Scottish Government understands and recognises both Douglas Mill & the Law Society of Scotland's concerted policy of intervention in claims & complaints against solicitors to ensure destruction of such client's chances of obtaining a measure of justice, to be the case. John Swinney knows of such policies only too well. 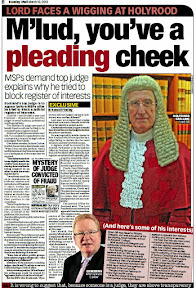 Mr Swinney has viewed piles of evidence, files, papers, media coverage, even revealing evidence in the Scottish Parliament himself, illustrating without a doubt, a general corruption in the Law Society's procedures & attitude against not only clients complaints & claims against solicitors, but also a generally prejudiced and provocative attitude towards & against the public interest. John Swinney, after all, has a constituent who has been through some of the worst experiences of prejudiced anti client regulation from the Law Society of Scotland, much of it at the hands of Douglas Mill himself. John Swinney, also understands a great many other people in Scotland have also had their complaints and financial claims against solicitors ruined, as a result of the same policies practiced by Douglas Mill, Philip Yelland, and others at the Law Society of Scotland. Kenny MacAskill, the Cabinet Secretary for Justice, does not accept this to be the case, indeed, Mr MacAskill, an ardent supporter of Douglas Mill, self regulation by the Law Society of Scotland to ensure control of all complaints, and it seems, a supporter of the legal professions such hateful, harmful policies of anti client prejudice when it comes to complaints & access to justice, has went further and condemned anyone who takes issue with the Law Society's own point of view that it must do as it pleases without recourse, honesty, accountability, or transparency. Why, one may ask, the radical differences between these two Cabinet colleagues ? 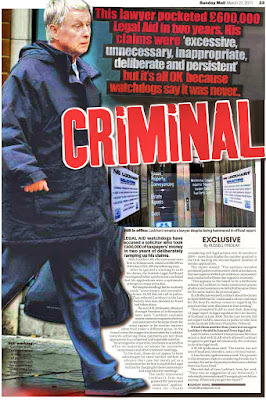 Kenny MacAskill is of course, a solicitor, and thus a member of the Law Society of Scotland. John Swinney is not a solicitor and is not a member of the Law Society of Scotland. Kenny MacAskill has stated many times it is his aim to defend the profession from anyone who misrepresents it - but Mr MacAskill really means he will defend the Law Society of Scotland against anyone who disagrees with it, for it is not with the general agreement of the unable-to-vote entire Scots legal profession membership that the Law Society of Scotland, and Doulgas Mill, drags it down into the gutter. Of the two Cabinet Ministers, which one is correct ? John Swinney or Kenny MacAskill ? Who as the bigger axe to grind to protect his professional colleagues, compared to the bigger axe to grind representing the community at large ? Clearly, Kenny MacAskill, a member of the Law Society of Scotland, will always, as he has said himself in the media & the Parliament, defend the Law Society of Scotland and the legal profession against anyone who disagrees with it's point of view. John Swinney, on the other hand, is doing nothing more than his duty - to represent the community, the wider public interest of us, the Scottish people, and his constituents who sought his help and are receiving it against a monolithic, greedy, corrupt system of self regulation of lawyers which surely must fall, along with anyone daft enough to support it. John Swinney understands clearly and accepts the need for change to the terrible way in which clients of crooked lawyers have been treated for years in Scotland. John Swinney has campaigned for and continues to seek a resolution to the terrible corruption at the Law Society of Scotland, while Kenny MacAskill seeks to protect it. Perhaps its now time for Alex Salmond as First Minister, to show his badge of office, and clear up this terrible injustice, terrible inconsistency, and terrible protectionism by an SNP Justice Secretary of a terribly corrupt institution, the Law Society of Scotland. Justice, fairness, fair play, accountability and trustworthy dependable legal services - it's not much for Scotland to ask and expect, is it Mr Salmond ? For a political party which is supposed to pride itself in being Scottish, the SNP have left Scots high & dry when it comes to the legal system and access to justice. 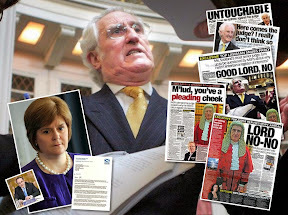 The SNP if anything, are fast becoming the party of injustice, in exponential quantities as the inadequacies of the Scottish legal system constantly come to the fore in daily doses of scandal after scandal with the Government seemingly unable or unwilling to do anything about it. 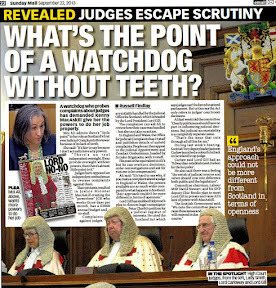 The spectacular failure of the World's End trial and the infighting it generated between the Lord Advocate & members of the Judiciary, the persistent refusal of the Crown Office to hand over evidence in the Lockerbie Trial, the consistent failures of the Crown Office to disclose evidence in many other criminal cases, leading to retrials or outright collapse of prosecutions, the lack of measures to address Police recruitment & legal reforms .. you name it, the SNP have failed it, when it comes to Law & Justice. Based on the above, and continuing problems in the Scots justice system, you could be forgiven for thinking the SNP are not a party of law & order, despite having a number of lawyers within their ranks. The latest SNP failure in the field of legal reforms surfaced this week (among many others) where Justice Secretary MacAskill rejected calls for an independent regulator of legal services in Scotland. There is nothing wrong with having an independent legal services regulator. In fact, England & Wales has an independent legal services regulator, and wider access to justice as part of the Clementi reforms to open up the legal services market in England & Wales. However, there is a problem for the SNP with having an independent legal services regulator and that seems to be because Kenny MacAskill, himself a solicitor, is afraid of an independent regulator of legal services and what it will do to his colleagues, especially the ones who fiddle & rip off their clients. 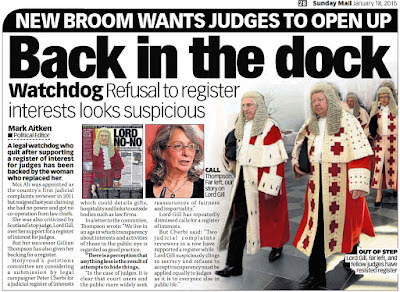 Full of bitterness, xenophobia & unashamed protectionism for a lawyers right to charge the public through the nose for anything and get away with it, the SNP's response to the OFT closes the door firmly on hopes for a fully opened legal services market and a much needed independent regulator for solicitors. So, Mr MacAskill doesn't want an independent legal services regulator. Does that mean he supports letting lawyers off the hook when they are caught swindling their clients ? Maybe examples of the likes of solicitor & Tory party luminary Iain Catto's swindles towards his disabled client is the stuff which Mr MacAskill is supporting by not allowing an independent legal services regulator ? Do we need a few more Iain Cattos, Mr MacAskill ? Is that why you don't want an independent regulator to police the legal profession ? Maybe examples of the likes of solicitor John G'O'Donnell and his 25 or so negligence claims from clients is the stuff which Mr MacAskill is supporting by not allowing an independent legal services regulator ? Do we need a few more solicitors still in practice with 25 plus negligence claims against them and clients unaware of who they are getting as a lawyer Mr MacAskill ? Is that why you don't want an independent regulator to police the legal profession ? For a clue on Mr MacAskill's motives for protecting a monopolistic business against the public interest reforms of a competitive legal services market & independent regulation, we must examine a solicitor's values who stands firmly by the policy statements & direction of the Law Society of Scotland, who for years, have lobbied against any change to regulatory practice and the legal services market. In general solicitors who support the Law Society of Scotland's policy of maintaining a monopolistic legal services model, where the public are forced to choose a member of the Law Society of Scotland to represent their legal interests, and who support self regulation of the legal profession, are hostile to change, will play every dirty trick in the book to stall or thwart legislative reforms, and will lash out & attack anyone who seeks to challenge their views. There are sadly, a good number of members of the Law Society of Scotland who subscribe to these protectionist views, and Mr MacAskill seems to exhibit quite a few of them himself. Additionally, as a member of the Law Society of Scotland, Mr MacAskill will no doubt have a vested financial interest in leaving the regulatory side of things as they are with the Law Society of Scotland, should his political career fail or end, and he has to return to the legal profession. Mr MacAskill, perhaps for those reasons, would rather herd the Scots public who may need access to legal services, into the willing open arms of the Law Society of Scotland, who for now maintain the exclusive monopoly on access to legal services in Scotland, and of course, want to keep that huge money making business which also generates convenient political influence over the likes of Mr MacAskill for themselves. 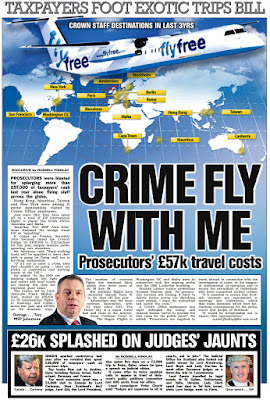 A good deal, for Mr MacAskill, and his lawyer friends, and a good deal for the SNP too as they get to control who gets access to justice in Scotland. Not a good deal for Scots though. This much is clear - The Scottish Government's attitude to the OFT seems to be that Scots have less of a right to access to justice & legal services than the rest of the UK. Did Scotland expect to hear such talk from an SNP administration which seems to be more concerned with protecting the rights of lawyers to regulate their own complaints and dominate the legal services market, than investing in the Scots public interest & Scots independent freedom of choice for who represents their legal interests ? CONSUMER groups last night criticised the Scottish Government for not backing calls to appoint an independent regulator to monitor the legal system. Kenny MacAskill, the justice secretary, has already made it clear that the status quo is "not an option" for the profession following the Office of Fair Trading's decision to uphold a complaint by consumer group Which? that the current set-up hinders market innovation. But the minister's official response to a series of OFT recommendations revealed no plans for a new regulatory body like the Legal Services Board in England. Mr MacAskill said he was "hugely encouraged" by the profession's response to his call for change earlier this year. At present, lawyers cannot go into partnership with non-lawyers, but the OFT believes consumers would benefit if these "alternative business structures" were overhauled. 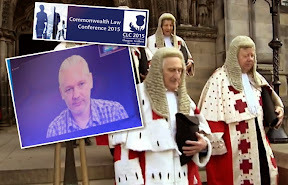 Julia Clarke, a campaigner with the Which? 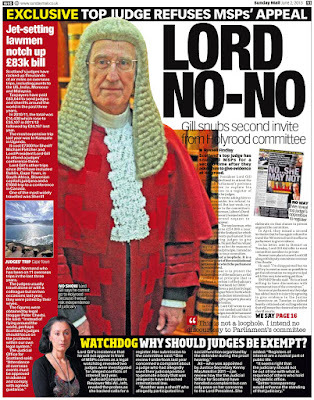 group, said: "This is a missed opportunity to put consumers at the heart of reforms to the Scottish legal profession. "We feel that, unless an independent body is created to regulate lawyers and advocates, consumers will be let down." The Scottish Government has not ruled out the possibility of supermarket solicitors or legal firms run by people who are not lawyers, Justice Secretary Kenny MacAskill said yesterday. Third-party ownership of legal businesses are among the options being considered for reform of the Scottish legal system demanded by the Office of Fair Trading. Currently, lawyers cannot go into partnership with non-lawyers, but the OFT believes consumers would benefit if these "alternative business structures" were overhauled. This has raised the spectre of supermarkets offering legal services as they do with in-house pharmacies and optician services. But Mr MacAskill affirmed his stance that Scotland will not be pushed into a new professional framework based on reforms in England and Wales. After a meeting with Philip Collins, chair of the OFT, he made clear Scotland's legal profession had to change in the light of a changing marketplace, nationally and globally. However, a Scottish solution needed to be found, he said. 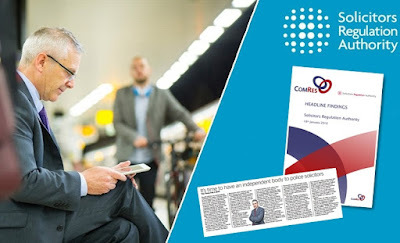 The controversy has been brewing since Which?, the magazine of the Consumers' Association, issued a complaint to the OFT that the legal set-up in Scotland disadvantaged the consumer, and called for reforms including a new supervisory body. The government's response makes clear there are no plans to set up a new regulatory body like the Legal Services Board in England. But Mr MacAskill set out four possible models for multi-disciplinary practices and third-party entry to legal services. They are - law firms with a minority of non-lawyer partners to assist in the management of the firm; law firms with a minority of non-lawyer partners offering alternative legal services; lawyers in a multi-disciplinary practice who are not in majority control; and third party ownership of legal businesses. He said: "We consider some forms of alternative structures could well provide benefits to consumers." But Which? campaigner Julia Clarke said: "This is a missed opportunity to put consumers at the heart of reforms. Unless an independent body is created to regulate lawyers consumers will be let down." The Scottish Government today published its response to the Office of Fair Trading report on alternative business structures for the legal profession. Justice Secretary Kenny MacAskill made clear that Scotland's legal profession had to change in the light of a changing marketplace, both nationally and globally, and that a Scottish solution needs to be found to the issues affecting the Scottish legal profession. The response sets out how the Government is working with the profession and others to take forward reform, and the timetable for future action. * Expect Law Society and Faculty of Advocates to put forward detailed proposals for consideration by the Government and approval by their members by Spring 2008. "This Government is committed to a strong and independent legal profession. We are determined that Scottish law firms should be able to compete internationally and that our legal system should be more attractive to major businesses. "Hand-in-hand with this aim, we must improve access to justice for our citizens, and ensure that consumers of legal services are properly protected. People's needs for legal services are very different from what they were 50 or even 20 years ago, and legal services need to reflect that. At the same time, we must protect quality and the core values of the profession. "Since becoming Justice Secretary, I have made reform of the legal profession one of my personal priorities. As a former partner in a law firm myself, I am very proud of the profession I once practiced in. It has already changed and must change further so it continues to provide an excellent service to consumers and businesses. "However, in considering changes to the profession we will not blindly follow an English model. I therefore welcome the OFT's conclusion that the Scottish legal market requires an appropriate Scottish solution. We are a small country with a small legal profession - we need to use the advantage that gives us in being able to adapt quickly to new challenges. "Last September, I challenged the leadership of the profession to bring forward firm proposals for change. I am hugely encouraged at the way in which they have responded so far. It is vital that we keep up the momentum, and the Government will be working with the profession in the early months of 2008 to turn the emerging ideas into real and practical reform." 'Which' submitted a super-complaint to the Office of Fair Trading (OFT) asserting that the current regulation of Scottish legal forms restricts choice to consumers and prevents the formation of alternative business structures. In its reponse the OFT has not assumed that the changes currently being proposed in England and Wales through the Legal Services Bill will be automatically suitable for the Scottish market. The OFT further recommended that the legal professions in Scotland take full advantage of these opportunities and that the Faculty of Advocates and the Law Society of Scotland lift any of their own practice rules which contribute to the restrictions discussed in their response. On November 1 this year, the Law Society of Scotland published a consultation paper entitled 'The Public Interest: Delivering Scottish Legal Services - A Consultation on Alternative Business Structures. The issue was debated in the Scottish Parliament on November 15, when the Government's approach was unanimously endorsed. Labels: access to legal services, Kenny Macaskill, OFT, Scottish Government, SNP, Which? 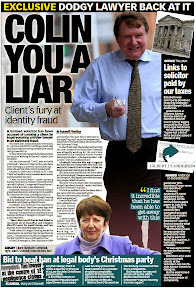 There is no doubt that solicitors & clients alike, can do without the Law Society of Scotland - the current state of Scotland's legal services market, the general disrespect and lack of trust the public afford the legal profession, and the numerous scandals which consistently rock Scotland's legal system and solicitor base, are evidence enough. 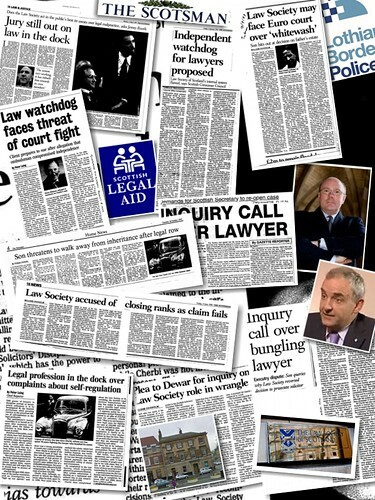 What good has the Law Society of Scotland done for solicitors over the years ? Well, the Law Society would claim it has raised standards of service & conduct within the legal profession. 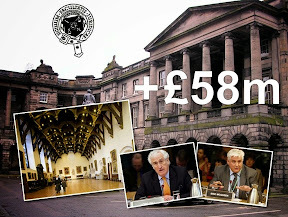 However, with five thousand plus complaints a year made against less than ten thousand solicitors in Scotland, many of those complaints relating to serious frauds, poor service & conduct, even embezzlement, fakery, corrupt schemes to swindle clients out of even their property, there can be no doubt that standards of service & conduct are at an all time low. 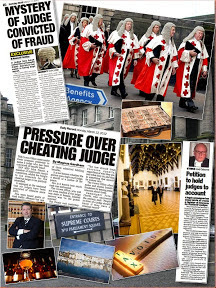 What good has the Law Society of Scotland done for clients & the public over the years ? The answer to that one of course, is none - no good at all. 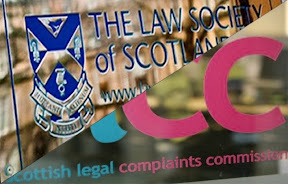 The Law Society of Scotland, particularly it's current leadership under the likes of Chief Executive Douglas Mill, has concentrated fully on protecting solicitors from client complaints, ensuring when issues of serious complaints arise, the client loses out each time, while the solicitor goes on practicing. Take for instance, a complaint where a solicitor had falsified a house & land sale - the client provided all kinds of evidence, even letters which fell into his possession from his own solicitor to a bidder on the property in question .. .scheming a deal so the solicitor & bidder would successfully gain a three million pound property for one tenth of its value, as the solicitor was holding his client for so long in the property sale, the client would go insolvent. The complaint went nowhere, the solicitor still practices, still has three houses of his own, still swindles clients, and hasn't a care in the world. The client who made the complaint - He received no compensation even through he tried to pursue the case through the court. His new solicitors who took on the case trying to recover damages for theft & negligence worked against their client all the time, acted on instructions from the Law Society to delay the case and ruin it so there would be no settlement - which is in fact what happened. The client & his family lost their home, their lives were destroyed, and he now has cancer. 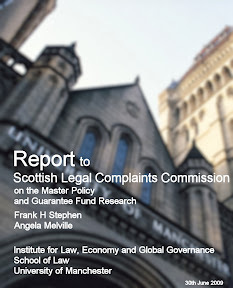 A situation repeated time & again, in the world of complaints against solicitors in Scotland. 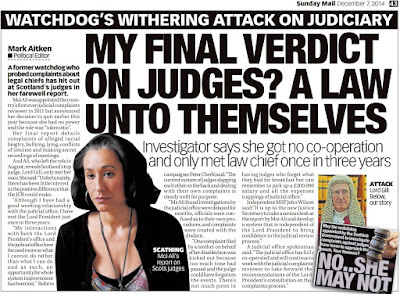 If you use a lawyer, the very same could happen to you just as easily, and there is nothing you will be able to do about it while the Law Society of Scotland exists. 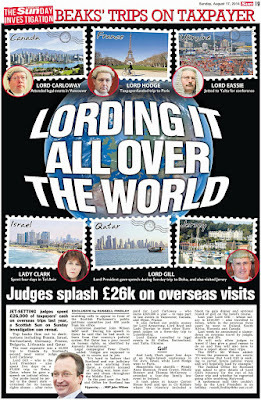 Good list, isn't it ... and there's lots more of course ... what appears above is only the tip of the Law Society's iceberg. 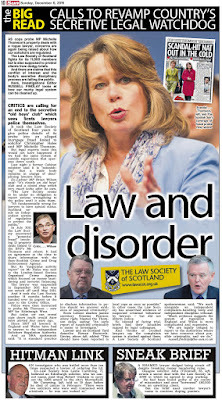 In this Monday's Law Section of the Scotsman, Jennifer Veitch wrote a piece entitled "Law Society must put house in order"
Nothing more than the usual line from Drumsheugh Gardens though, no room for substantive debate, and a distinct lack of reporting on how the Law Society notably achieved some amendments to the much feared & bitterly debated Legal Profession & Legal Aid (Scotland) Act 2007. 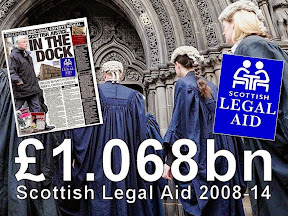 "The previous 12 months were dominated by the bitter debate over the Legal Profession and Legal Aid Bill, and its proposals for a Scottish Legal Complaints Commission. When the Bill was finally passed last December, some of the sting was removed, with lawyers having the right of appeal against the commission's decisions. But if the Law Society's head honchos had known what 2007 had in store then they might not have seemed quite so cheery at the end of 2006." 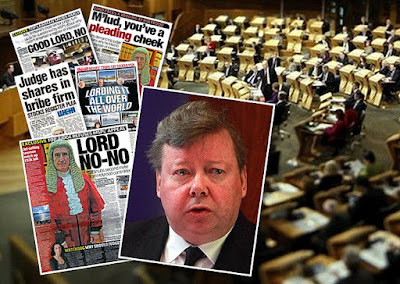 Yes, indeed it was a bitter debate, with the dirty tricks brigade from the Law Society on duty seemingly 24 hours a day to threaten anyone who would put forward evidence to the Parliament on the inadequacies of the Law Society of Scotland and it's solicitor membership .. 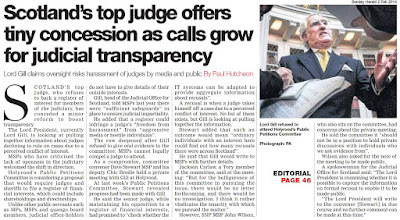 The dirty tricks from the Law Society of Scotland fell out of control, with public skirmishes in front of the Justice 2 Committee between John Swinney & Law Society Chief Executive Douglas Mill over secret memos which clearly showed deliberate corruption & intervention in client claims against overtly corrupt solicitors. 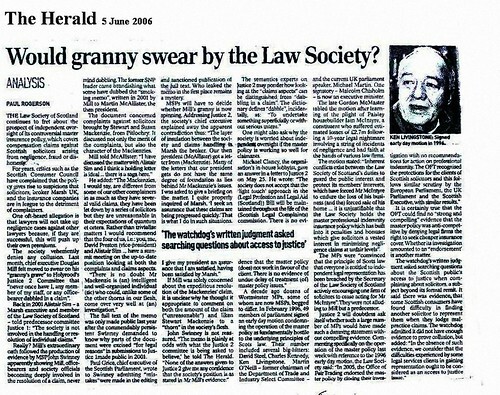 Would [Douglas Mill's] granny swear by the Law Society ? As the LPLA Bill debate progressed, and the Law Society of Scotland feared losing control of complaints and client claims, an English LibDem Peer, Lord Lester of Herne Hill QC was drafted in to write the bizarre legal opinion that "it would breach the human rights of lawyers to allow anyone else except a colleague to consider & investigate complaints against themselves." 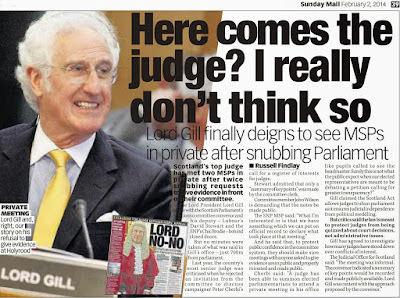 Law Society Chief Executive Douglas Mill, then used the Lord Lester opinion to threaten legal action against the Scottish Parliament & Executive if certain amendments agreeable to the Law Society were not put into the LPLA Bill. 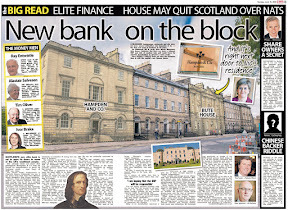 Despite what some feel, if the Scottish Parliament & Executive changed legislation or amended it because of a legal threat from a profession with a vested financial interest in keeping such legislation restricted in its effect ... that is a big story. Big enough to be of significant public interest .... but not even a mention, as I'm sure if there was, Mr Mill would have been straight on the phone to have it removed. The SNP Government are currently being attacked over a meeting between Alex Salmond and Donald Trump, over the calling in of Mr Trump's golfing development in the North East, as of course, Mr Trump has a vested interest in the proposals going through, and it does appear to some, that planning rules have been tossed aside in this matter, indicating a slight 'bending of the rules' to get the development through. So, what the Law Society of Scotland has to do is not put its house in order.The time for that is over. 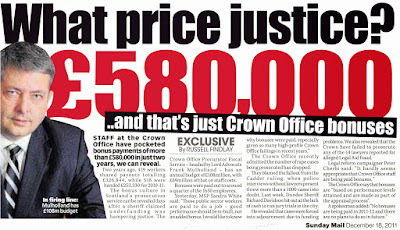 The Law Society of Scotland, has shown, it cannot change. It is too inflexible, too used to making threats to get it's own way, too used to delay to ensure nothing changes, too used to using dirty tricks to take out critics, opponents, and any client who may be a thorn in it's side, and too used to prejudice, protection of the guilty, and too used to having undue influence over public life. The Law Society of Scotland should rather, jump off a cliff into extinction, and allow both solicitors & clients to get on with managing a relationship between the legal profession & public based on trust, accountability, transparency, and yes, even friendship. If solicitors wish a representative body for their industry - yes by all means form one. Form one that gives you, each solicitor, a VOTE, in everything your new representative body will do for you. Make sure though, your shiny new representative body for the legal profession doesn't end up with the likes of the Law Society's current dictatorial leadership hell bent on protecting it's own political influence & power base, which has done exponential damage to the legal profession as a whole more than anything in history. If the public wish a representative body for legal services, and by all means I would heartily advise it, ensure that such a body exclusively represents your interests as the client, has adequate powers to protect clients interests, ensure issues be tackled & publicised, and is able to ensure that complaints be dealt with properly, fairly, and with compassion. 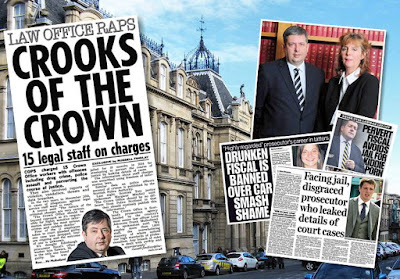 We don't need the Law Society and it's dirty bag of dirty tricks any longer - it's time for a change - a change for solicitors & the public alike, a change for the better, a positive change for Scotland. THIS time last year, the legal profession - or at least those concerned with plotting its direction - appeared to breath a collective sigh of relief. 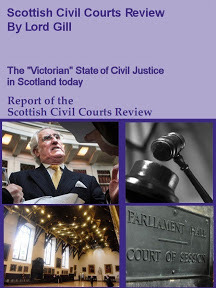 The previous 12 months were dominated by the bitter debate over the Legal Profession and Legal Aid Bill, and its proposals for a Scottish Legal Complaints Commission. When the Bill was finally passed last December, some of the sting was removed, with lawyers having the right of appeal against the commission's decisions. But if the Law Society's head honchos had known what 2007 had in store then they might not have seemed quite so cheery at the end of 2006. Thanks to the curveball of the Which? super-complaint to the OFT, this year has been dominated by an accelerated debate on the dreaded alternative business structure. Of course, everyone in the profession has been prattling on about Clementi for so long without similar proposals being seriously mooted for Scotland that perhaps the Law Society could have been forgiven for being lulled into believing it could escape the march of Tesco law. To be fair, when the Research Working Group on the Legal Services Market in Scotland reported in April 2006, it recommended against intervention. But, after Which? forced the issue, the OFT turned its attentions to the Scottish marketplace, and soon the profession was presented with a list of recommendations for reform, just in time for the Law Society's conference on ABSs. To say there was no shortage of opinions aired at September's debate would be putting it mildly. Lawyers from across Scotland offered the society plenty of food for thought about the impact of ABSs on legal services and particularly with regard to access to justice. The profession appeared divided into two camps: broadly speaking, there were those who make money, and want to stay competitive in order to keep doing so; and those who are struggling to keep afloat and fear the ABS would send them under. The big question was how the society would attempt to reconcile the two, and it promised the debate would inform its options paper, published with little fanfare on 1 November. Yet this consultation paper stopped short of putting forward proposals that might give further direction to the debate. It certainly covered the pertinent issues arising from the main forms of ABS. It also stated that the society's council considers "it is now right to facilitate some changes", though it would prefer to see stepped or phased changes introduced. But it was surprisingly light on offering pragmatic solutions. The society could no doubt argue its lack of prescription is a virtue - it is not prejudging the response from the public and will use the consultation, which ends on 31 January, to inform the process. But the Scottish Government still intends to respond to the OFT's recommendations by the end of this year. So is there a danger ministers will move ahead with their decision-making, without the benefit of clear directions emanating from the legal profession? The profession has been looking to the Law Society to grasp the nettle on this issue, and provide leadership, and some much-needed certainty, for the marketplace. Kenny MacAskill, the justice secretary, extended a clear invitation for the profession to take the lead, with the caveat that there was not the luxury of unlimited time. But the problem here appears to be that the Law Society is structured to need lots of time to respond to anything. Any decisions of significance need to be run past committees and its council. And setting aside the current debate over market reforms, the Law Society's role is about to change markedly. 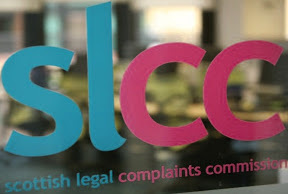 When the new Scottish Legal Complaints Commission opens next year, at a date still to be confirmed, it will be unburdened of its role in investigating service complaints from consumers. Theoretically at least, this should free up resources and allow the society to focus on issues such as alternative business structures and the ongoing debate to overhaul legal education. The society has statutory duties to regulate and represent the profession, bearing in mind the public interest. To have any hope of doing this effectively - in whatever brave new regulatory world we are about to enter - it will need to get its house in order in 2008. 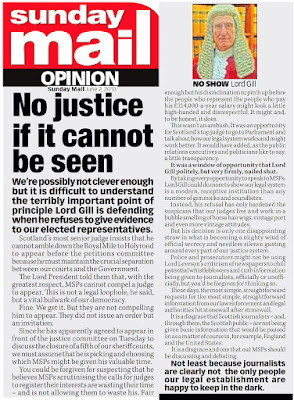 Some readers were concerned enough over my last article on Bill Aitken's comments in the legal services debate, to raise the issues with Annabel Goldie and the Presiding Officer of the Scottish Parliament. I will report here any developments I learn on such representations. Some readers also asked me if there were other conflicts of interest which may be affecting Mr Aitken in his policy of supporting the lawyers long held monopoly on legal services. Well, I can tell you that Bill Aitken used to work for Eagle Star Insurance, who were the first insurers to the Master Policy Insurance of the Law Society of Scotland, and as you will probably gather, Mr Aitken's previous work may well be powering ahead his current love & praise of the Law Society and its officials, who wish to retain the lawyers monopoly on access to justice. Bill Aitken was born on the 15 th April 1947 and educated at Allan Glen's School in Glasgow. From 1965 until 1999 he worked in the Insurance Industry as an insurance undewriter and sales developerfor Eagle Star and AGF Insurance. He was also a District Court Judge from 1985 until 2000. In 1993 he was appointed Deputy Lord Lieutenant of the City of Glasgow. He is single. Coming from a long background in the insurance industry, Mr Aitken willl know full well & understand, the insurance industry are one of the principle financial beneficiaries of maintaining the Law Society of Scotland's monopoly on legal services in Scotland as anyone who works in legal services must pay into the Master Insurance Policy of the Law Society of Scotland - otherwise they don't work. Indeed, one of the restrictions placed on applications under the recently implemented Sections 25-29 of the Law Reform Act 1990 into the legal services market, is that applicants have indemnity insurance, which in practice must pay into the Master Insurance Policy of the Law Society of Scotland, now operated by Marsh UK. 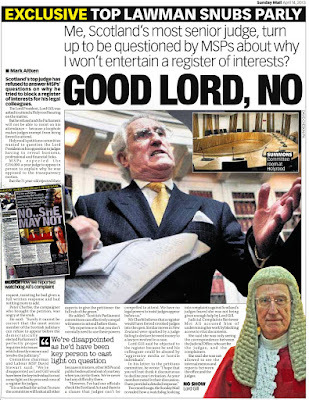 It might have been better if Mr Aitken had declared such an interest along those lines, before making as much parliamentary praise as he gave for Law Society officials who last year threatened legal action against the Parliament over the passage of the LPLA Bill, or making such public protests at the possibility that Scots may be able to choose who they want to represent their legal affairs, not who the legal profession order them to choose. Anyway, I await a reply from Annabel Goldie as to whether she will see fit to apply the same high standards impartiality she respectfully applied to herself last year when she resigned from the Justice 2 Committee so that J2 could be seen to have a more impartial Convener for the debate on the LPLA Bill. I will cover any reply in a further article. Scotland differs from England & Wales when it comes to access to justice, because for now at least, the Scottish National Party do not support the full implementation of choice and free competition in the legal services market. For now anyone who needs to get to court, or use critical legal services, must go through a member of the Law Society of Scotland. You simply have no other choice. There is no one currently allowed other than solicitors or advocates to perform such courtroom representation for you. Similarly, many everyday legal services which you may require at some point in your life also require the use of a solicitor. You simply cannot get away from it ... currently to use legal services in Scotland, the ones you need - you must use a solicitor. All political parties are aware of this. 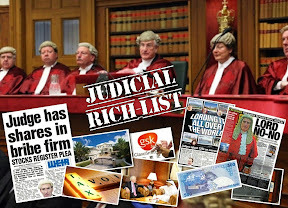 Indeed all the major political parties in Scotland, have lawyers or ex-lawyers in prominent positions within their parties, many of whom benefited financially from the decades old monopoly on legal services their profession holds over the public's use of law in Scotland. Kenny MacAskill MSP for instance, now an 'ex-lawyer', only came into politics in 1999, worked as a solicitor and senior partner in an Edinburgh law firm from 1984 until 2000. Mr MacAskill, as a solicitor for some sixteen years, therefore knows full well the Law Society of Scotland's monopoly on access to legal services which dictates who can & cannot obtain legal representation, and who is allowed, or is denied, access to justice. It would be true to say, Mr MacAskill, like other currently practicing lawyer or 'ex-lawyer' MSPs in the Scottish Parliament, such as Annabel Goldie, David McLetchie, Nicola Sturgeon, and many more, have all benefited financially from the Law Society of Scotland's closed shop on access to legal services, and the failure of successive Scottish administrations since 1990 to implement the Law Reform (Misc Provisions) Act (Scotland) 1990, specifically Sections 25-29, which were designed to open up legal services in Scotland to wider competition & choice for the consumer. What did any of those currently practicing lawyers or ex-lawyers who are MSPs say about the failure of successive administrations to implement the 1990 legislation on widening choice of legal services ? Nothing. Nothing at all. Not a peep from anyone. 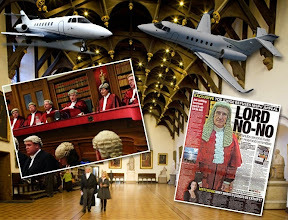 It simply was not in Mr MacAskill's, Ms Goldie's, Mr McLetchie's, Ms Sturgeon's, or any of the other lawyer or 'ex-lawyer' politicians financial interests, and more importantly the interests of the Law Society of Scotland & the legal profession for any of them to say anything about it, or do anything about it and that is why it has taken seventeen years to implement Sections 25-29 to allow persons other than those who are members of the Law Society of Scotland to apply for rights of audience. Of course, we all know now that Sections 25-29 were implemented in March of this year, so naturally, we should be seeing a crop of new entries into the legal services market, able to take up the public's demand for choice, competitive pricing and well regulated standards of wider legal services but that has not happened, due to the restrictive, protectionist policy which surrounds the current Justice Secretarie's view of the implementation of the seventeen year old legal market competition legislation. You [John Swinney] will be interested to know that the commencement of Sections 25-29 of the Law Reform (Miscellaneous Provisions) (Scotland) Act 1990 came into effect on 19 March 2007. The Sections provide for rights of audience and rights to conduct litigation in the Supreme Courts to be granted to members of professional or other bodies, subject to approval in each case of a draft scheme embodying certain safeguards such as training programmes and indemnity insurance. The legislation does not provide for applications from individuals. Guidance has been prepared that covers in some detail the provisions to be contained in draft schemes and the consideration of applications. I hope this reassures you that action has now been taken to increase consumer voice in the supply of legal service providers. So, that sounds straight forward enough. The impression is given it is fairly easy for someone, albeit a member of a professional or "other body subject to approval in each case of a draft scheme embodying certain safeguards such as training programmes and indemnity insurance" can apply under Sections 25-29 to enter the legal services market, and represent the public in court. Well, this is not the case at all, and all applications which have been made under Sections 25-29, have so far failed, because, the Law Society of Scotland wants to retain its control and monopoly on the legal services market, who is allowed to enter it, and who is allowed to offer wider choice and competition for the public in their choice of legal representative. It's natural. The Law Society don't want anyone else to be allowed to enter the legal services market, because if there is wider choice, the Law Society's own member solicitors will lose out. Wider choice of legal services means not having to pay the likes of £150+VAT for 3 lines of text on an A4 'lawyers letter' or £60+VAT for a single email reply from your lawyer ... because of course, wider choice will bring entrants in to the legal services market who wont be charging those kinds of fees. How about all those expensive wills, conveyancing, poorly performed court work & case preparation, bad financial advice, and many other poor services clients get from lawyers, who have even gotten away with mortgage mis-selling because the Law Society of Scotland let them off the hook ? Well, all that would be a thing of the past if the legal services market were opened up properly, to the standard of the recent OFT recommendations for wider access to legal services. 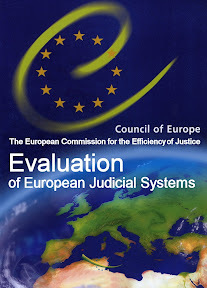 Increased competition, the entry to the legal services market of firms willing to offer expert legal services at competitive prices, and crucially, a fully independent legal services regulator (not the Law Society of Scotland) with strong powers to ensure the highest standards of practice in the opened legal services market, would give the Scottish public the rights of access to justice, access to legal services, and unrestricted choice, which we deserve in Scotland. The SNP did not implement Sections 25-29. The previous Scottish Executive did that, albeit a bit too late in the day after some eight years of rule. If anyone asked me now whether I think the SNP would have implemented Sections 25-29 if they had not been implemented by the previous administration, I would say - No, the SNP would not have implemented Sections 25-29 of the Law Reform (Misc Provisions) (Scotland) Act 1990. If anyone asked me now whether I think the SNP would have passed the Legal Profession & Legal Aid (Scotland) Act 2007, I would say - No. On the basis of the available evidence and conduct of the SNP in the legal services debate, an SNP administration would not have passed the Legal Profession & Legal Aid (Scotland) Act 2007. Some members of the Scottish National Party appear not to want the Scottish public to have free choice of quality & well regulated legal services, and those elements of the SNP who do not want to give full choice to the Scottish public, have supporters in their cause - the Scottish Conservatives. The Scottish Conservatives do not want to break the Law Society of Scotland's monopoly on access to justice. Members of the Scottish Conservative party have openly protested in the media against breaking the lawyers control over legal services, and have made the same protectionist statements in the Scottish Parliament. Strange, the Conservatives would wish to maintain a business monopoly, when successive Conservative Westminster administrations have broken up long established monopolies & sold them off to the public, promoting wider competition and public choice in those business sectors. The legal services sector however, is a different matter, and the Conservatives wish to protect the legal profession's monopoly on access to justice, principally, because of the financial and political influence the legal profession hold in public life today. For an industry such as the legal profession to be allowed to order you, the public, to take what you are offered as a legal representative, and be forced to pay the prices the legal profession itself dictates to you, is anti competitive, monopolistic, and dishonest. For an industry such as the legal profession, to be allowed to regulate itself, ensuring that there is no proper investigation of complaints, no transparency or independent regulation, no accountability, no compensation, no chance of recovery, no chance of making a claim, no chance of outside help, when you receive substandard legal services, or incur huge financial losses through the negligence of one of its members, that is an industry 'unfit for purpose', regulated by itself in the common practice of utmost prejudice against the public. Kenny MacAskill and Bill Aitken's support of such a monopoly is not good for Scotland, and not good for the public's right to choice in access to legal services & justice. Kenny MacAskill once said in the Scotsman in February 2006 : "There are good reasons for having a monopoly-regulated profession; otherwise, how do you regulate those not part of the organisation?" The Law Society of Scotland has done a good job of ensuring that clients receive no proper regulation when making a complaint or a claim for damaging losses at the hands of negligent, crooked or incompetent solicitors. Wider choice of legal services means a break from the past, a break from high fees for poor legal services, a chance for better, independent regulation, a chance to break political influence in politics which has purposely delayed public interest legislation for decades, a chance of transparency, a chance of honesty & accountability, a chance of better standards, and a chance for anyone to obtain access to justice and legal services outwith the dictates of the legal profession itself. Give Scotland its right - Give Scotland wider choice, better independent regulation and higher standards of legal services the public can trust, use, and rely upon. Bill Aitken MSP, the current Scottish Conservative's Justice Spokesman lacks impartiality in debates & investigations on legal issues. Mr Aitken, however, is mired in conflict of interest issues relating to support for the legal profession's expressed desire to retain monopoly on legal services and regulation. 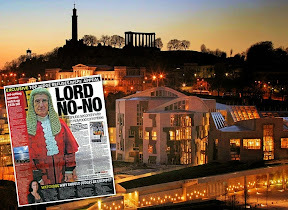 As Convener of the sole Justice Committee at Holyrood, the public interest is not being served by such activities & opinions Mr Aitken has engaged in and expressed, activities & opinions which relate directly to attempts to kill off widely accepted and much needed public interest reforms to the Scots legal system. Mr Aitken should either resign his position, or be replaced in the Conservative's Justice portfolio to make way for someone who can handle impartiality and free, open debate. The Scottish Conservatives have a chequered history when it comes to reform of the legal profession. True, it was a Conservative Government which passed the Law Reform (Miscellaneous Provisions) Act 1990 which gave us the Scottish Legal Services Ombudsman and also of course, the now infamous Sections 25 - 29, which were designed to open up the legal services market for Scots long before anyone else thought of it. Well, the Scottish Legal Services Ombudsman has as we all know, been of limited use in regulation of the legal profession .. mainly because the office did not have statutory powers of enforcement, nor, for the main, would it dare make the necessary recommendations to reform regulation of solicitors in Scotland, for fear of upsetting the Law Society and the legal establishment. We all know the fate of Sections 25-29, the ground breaking legislation which was designed to open up access to legal services in Scotland long before Clementi took shape in England & Wales ... it simply was not implemented until this year, some seventeen years later than it was designed to be implemented, due to a constant lobbying from the legal profession to keep control of access to justice. Scotland's government and legal establishment has been accused of continuing to drag its heels on reforms intended to open up the justice system and reduce the costs of litigation. Sections 25-29 of the Law Reform (Miscellaneous Provisions) (Scotland) Act 1990 were intended to end the country's legal closed shop by allowing people other than advocates and lawyers to have rights of audience in Scottish courts. However the four sections of the 1990 act were dormant on the statute book for 17 years. They were finally implemented in Scotland by Jack McConnell's government on March 19. However, nine months on, no professional bodies have secured rights of audience for members. The rights, which ended the legal closed shop in England and Wales in 1997, can be granted to professional organisations but not to individuals. The Scottish Government is insisting that, in order to qualify, any professional body must prove it has certain "safeguards" in place, including codes of conduct, training programmes and indemnity insurance. Campaigners for access to justice suspect the Scottish government's failure to act on the reforms is because neither the justice secretary Kenny MacAskill nor the Lord President - who together must approve each and every application - have the appetite for change. The Association of Commercial Attorneys, whose 20 members specialise in handling construction industry disputes, applied for rights of audience in Sheriff courts on June 29. 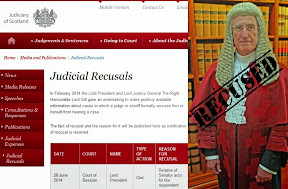 Last month, the body was disappointed to receive a letter from the Lord President, Lord Hamilton suggesting it was insufficiently well-established to be able to properly regulate its own members and therefore that it would probably find itself ineligible for rights of audience. David Whitton, Labour MSP for Strathkelvin and Bearsden, believes this is pure protectionism. He challenged MacAskill on this during a recent debate on the legal services in the parliament, and has sent three subsequent written questions on the matter. During the debate, Whitton asked MacAskill why the rights had not yet been granted to anyone. Whitton said: "I urge the cabinet secretary to put aside his earlier prejudice and give the people of Scotland the affordable choices that currently are enjoyed in the rest of the UK." However MacAskill said he was "not convinced" that sections 25-29 would be of any benefit, and that he had not changed his views on the matter since writing an article in the Scotsman in February 2006. In this MacAskill said he had "yet to be convinced that the move would benefit the legal service, rather than make the situation worse There are good reasons for having a monopoly-regulated profession; otherwise, how do you regulate those not part of the organisation?" MacAskill's public hostility to change appears to contradict what he said in a leaked letter to cabinet colleague John Swinney. In this, MacAskill said: "You will be interested to know that the commencement of the sections came in to effect on 19 March 2007 Guidance has been prepared that covers in some detail the provisions to be contained in draft schemes and the consideration of applications. I hope this reassures you that action has now been taken to increase consumer choice in the supply of legal service providers." A spokesman for ACA said: "We are concerned that the cabinet secretary for justice - who has an involvement in the consideration of our application - has formed a view without putting forward any evidence to substantiate how he has arrived at his position." Can any political party say they were clean on this ? Well, after seventeen years of all parties sitting back, and failing to do anything on this issue, the answer of course, is "No". When 1999 came around, and Scotland gained it's Parliament at Holyrood, there was a Conservative with a differing view on legal reform. His name is Phil Gallie. Addressing the issue without need of recourse to the legal profession, Mr Gallie put forward the issue of reform of the legal profession to the then Justice & Home Affairs Committee, Chaired at the time by Roseanna Cunningham MSP. 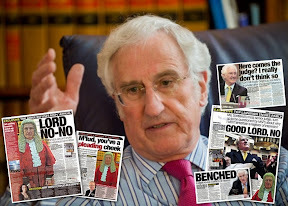 Unfortunately, the 1999 version of today's Justice Committee retired Mr Gallie's proposal, on the basis it had too much business for the time, but, undaunted by a lack of will on the part of some to look into how the legal profession ran itself, and the Justice system, Mr Gallie again brought the issue before the Justice 1 Committee of the Scottish Parliament in 2001, then Chaired by Alistdair Morgan MSP, and was successful in gaining a Parliamentary investigation into regulation of the legal profession. Phil Gallie's attention to detail, understanding of the complex issues, and service to his constituents in this effort was substantial and effective. I know, because I was one of those who asked Mr Gallie to put forward the issue, on both occasions, 1999 and 2001. 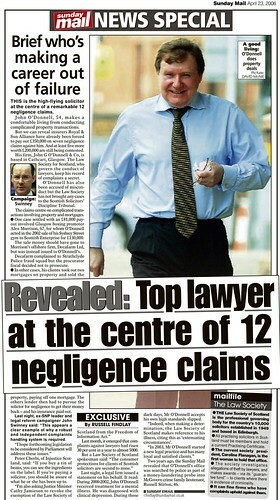 2001 was then set to be a good year and for the first time, would see a significant Parliamentary investigation into the workings of the legal profession, buoyed by the fact that the likes of Phil Gallie was a member of the investigating Justice 1 Committee which would do the work, leaving no stone unturned in the Justice 1 Committee's investigation of the legal profession. However, this was not to be. After the summer recess, the Justice 1 Committee under the Chairmanship of Christine Grahame MSP (SNP) took up the terms of the inquiry and began establishing it's remit. Phil Gallie, still the Conservative Justice spokesman and member of the Justice 1 Committee began to ask questions which indicated he would be seeking substantive answers to the way the legal profession, and particularly the Law Society of Scotland conducted itself, in all things from regulatory issues to that of business, and policies towards clients, even client complaints. After Mr Gallie's forced replacement in the Justice portfolio by David Mcletchie, the chance for a reasonable inquiry in 2001 was lost. 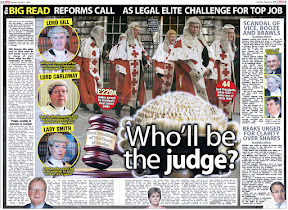 Indeed, the remaining members of the 2001 Justice 1 Committee, including SNP Convener Christine Grahame, turned the "regulation of the legal profession" inquiry into a vote of confidence in the Law Society of Sotland, and went so far to deny the public access to much of the submitted information, even denying public appearances & testimony from people who were easily able to destroy whole sections of blatantly false testimony before Parliament by the legal profession. 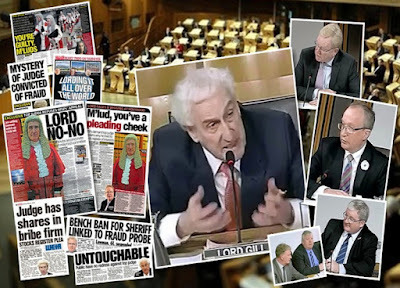 I was of course, one of those who were barred from appearing before the 2001 Justice 1 Committee inquiry, even though it was Phil Gallie who had secured the inquiry after my campaign, along with a great many others, to get such an investigation. 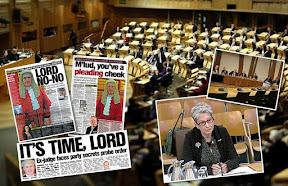 After Christine Grahame's Justice 1 Committee made a mess of the investigation into lawyers, the issue reverted back to the Scottish Executive and campaigners to pursue, and in 2006, the Legal Profession & Legal Aid Bill, was presented to the Justice 2 Committee of the Scottish Parliament for investigation and consideration. Annabel Goldie MSP was Convener of the Justice 2 Committee in 2006, being also the Conservative's Justice Spokesman. 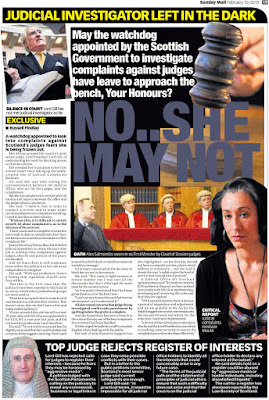 Annabel Goldie was, and is also of course, a solicitor, and thus a member of the Law Society of Scotland, which would figure highly in such an investigation, so, Ms Goldie, fearing a conflict of interest in her position as Convener and also a solicitor with a vested interest against the terms of the LPLA Bill, resigned her position as Convener, and fellow Conservative David Davidson MSP was elected in her place as Justice 2 Committee Convener. THE leader of the Scottish Conservatives has resigned from a key parliamentary post in an effort to head off a "conflict of interest" row. Annabel Goldie is stepping down as convener of the powerful Justice 2 committee just before it begins scrutinising proposals for a major shake-up of legal services, including plans for an independent legal complaints body. Ms Goldie is a partner in the Glasgow law firm Donaldson, Alexander, Russell & Haddow and a member of the Law Society of Scotland, which under the proposals will see its powers of self- regulation reduced. She is no longer a practising solicitor, but despite that has decided to quit to avoid a potential conflict of interest. She said: "I have intimated to the parliament my desire to step down from the Justice 2 committee. "This is a suitable time to do so as the committee will be looking at legislation on the regulation of the legal profession. Stepping down now avoids any perception of a conflict of interests." Under rules of parliament, committee members are expected to disclose a potential conflict of interest, but are not required to step down. Political opponents questioned how long she could have continued such demanding twin roles. Nicola Sturgeon MSP, the deputy leader of the SNP, said: "I have always wondered whether she could combine being leader of a party with leader of a committee." 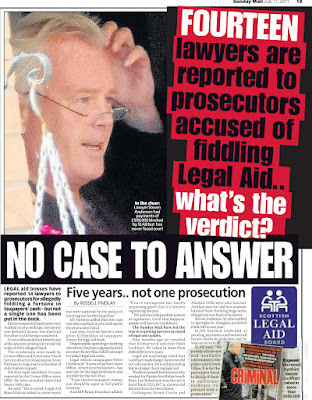 The Justice 2 Committee's inquiry into the LPLA Bill began swiftly in early 2006, and addressed many of the failings of the past attempts to look into the issue, including the failed SNP chaired version of 2001-2003 which managed to make matters worse for Scots when it came to legal services & regulatory reform. After stormy questioning sessions, which saw revelations of direct interference by Law Society Chiefs such as Douglas Mill in client cases against negligent lawyers, revelations of many anti client policies, false testimony from insurance firms, themselves indicted on corruption charges for market fixing in other countries, open confrontations between Law Society executives and politicians on conflicting evidence & testimony, the public were finally allowed to speak and have their day in Parliament, attesting to experiences with the Scots legal profession, so much, and so bad, the LPLA Bill cleared the Justice 2 Committee with a recommendation for vote & passing into law. 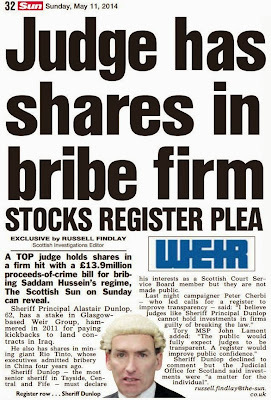 The Corrupt Link Revealed - How the Law Society of Scotland manages client complaints & settlements. The Law Society of Scotland did not take the prospect of losing control of complaints lying down of course ... and mounted an intense public campaign of obstruction, deceit and threat to prevent the LPLA Bill being passed, and sequestered the support of several MSPs to put forward their views and amendments to the Parliament. One of those taken on board by the Law Society to promote the legal profession's campaign against reform, was Bill Aitken MSP. While Law Society Chief Executive Douglas Mill was busily preparing a legal challenge against the Scottish Parliament & Executive over the passage of the LPLA Bill, by drafting in the English QC Lord Lester of Herne Hill to author a bizarre opinion that 'it was a lawyers human right under ECHR to regulate complaints against lawyers', Bill Aitken was steadily discussing & preparing a raft of amendments to the LPLA Bill which the Law Society of Scotland required to be implemented before the bill would finally pass. In short, Bill Aitken was the Law Society's gun, placed to the head of the Parliament. 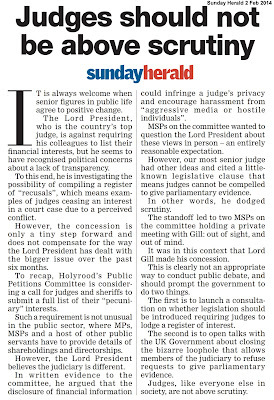 Amendments to Scottish Executive LPLA Bill reveal possibility of contempt charges against Law Society officials. Many of Mr Aitken's amendments did not pass, including that of limiting the fine system for crooked lawyers, but his actions demonstrated a clear course of support and affiliation to the Law Society of Scotland, and thus, a support for the actions and words of the Law Society of Scotland and many of it's officials in the debate on the LPLA Bill. Notwithstanding the efforts of Mr Aitken, the Law Society, and their allies to prevent passage of the LPLA Bill, the legislation was passed after a debate in Parliament in December 2006, which even saw John Swinney MSP enter the fray once again, informing Holyrood he was in possession of even more evidence to show a culture of interference, obstruction, and corruption at the Law Society of Scotland when it came to regulatory practice. You can view some of Mr Swinney's comments during the 2006 LPLA Bill debate in which he reveals significant problems with access to justice and corruption within the Law Society of Scotland by visiting InjusticeTV. The Legal Profession & Legal Aid (Scotland) Act 2007, as the LPLA Bill is now known goes forward in implementation, although scattered reports of interference and threat from the Law Society still reach me, particularly it seems, interference in the formation of the new Scottish Legal Complaints Commission, in which a senior source at the Scottish Government claims "the SNP don't have a clue on how to go about this" and "the Law Society are never off the phone these days" badgering against the full spirit of the LPLA Act .. as could be expected. However, the LPLA Act is not the only piece of legislation to change the Scottish legal landscape which is worrying lawyers. Even more worrying to the legal profession, is the idea of opening up the legal services market and thus breaking the monopoly on access to legal services currently held by lawyers & advocates, where, if you want to get to court, or use critical legal services, you must use a solicitor who is a member of the Law Society of Scotland. The Law Society of Scotland support retaining the monopoly on access to legal services, and restricting your choice of legal services & legal representatives. 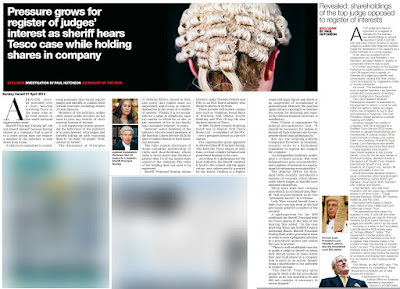 The Law Society of Scotland also supports retaining exclusive control over regulation, and has threatened legal challenges if it is not allowed to remain in charge of complaints. Bill Aitken, who is now the Scottish Conservative's Justice spokesman and also the Convener of Holyrood's sole Justice Committee, which must consider issues such as these, also supports retaining the monopoly on access to legal services - in the interests of keeping the profits of the legal profession healthy, and as I have reported above, also supports lawyers retaining control over regulation, so far as to even congratulate and praise the very same people who have threatened Parliament & the Government with legal challenges if their professional interests are not met and served. The question is, or perhaps I should say, the standard is : would Annabel Goldie MSP have done the same in her position as Justice Spokesman & Convener of a Justice Committee ? Would Annabel Goldie have publicly supported retaining a monopoly on legal services and denying the public access to justice if she had been Convener of a Justice Committee ? No, I don't think she could have supported such an outright protectionism as Convener of the Committee responsible for considering it. Ms Goldie is a solicitor, she has a vested interest in retaining a monopoly of legal services, and in any case, the wider public interest must be served by a Convener of a Parliamentary Committee, not that exclusively of a profession or a supporting profession. Would, perhaps, Annabel Goldie have publicly supported retaining control over regulation and proposed amendments to legislation which came direct from the Law Society itself if she had been Convener of a Justice Committee ? 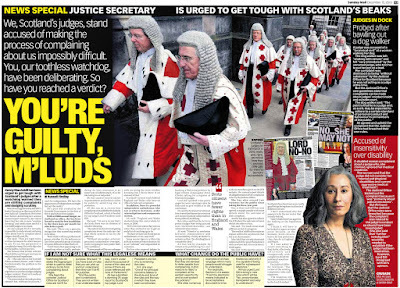 I doubt very much Ms Goldie, in a position of being Convener of a Justice Committee, would have supported the Law Society retaining control of regulation, as again, she is a member of the Law Society of Scotland, and has a vested interest in her governing body retaining control over regulation. This very issue is why Annabel Goldie resigned her position as Convener of the Justice 2 Committee in 2006. Bill Aitken, while not a solicitor, shares those same conflicts of interest, perhaps to a greater extent, given his willingness to propose anti public amendments to much needed public interest reforms, and express support for the Law Society and individuals within the legal establishment who have directly threatened the Parliament & Government with legal action if their wishes were not met. Mr Aitken's position on these issues, as Convener of the single Justice Committee now in the Scottish Parliament, and Scottish Conservative Justice Spokesman, does not serve the interests of impartiality and the public interest. He is expressly serving the legal profession in his views and deeds, and as Convener his view may well be unduly influential. He should therefore be replaced. 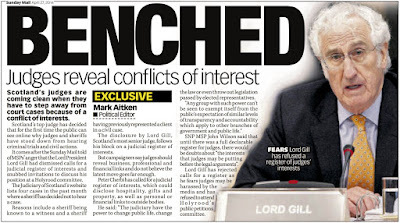 The same high standards of impartiality and avoiding of conflict of interest, demonstrated by Annabel Goldie, who respectfully and admirably, applied to herself in 2006 and resigned from the Justice 2 Committee to serve the public interest, should now be applied to Mr Aitken. The Scottish Conservatives therefore need a new Justice spokesman, and Parliament & Scotland, need an impartial Justice Committee Convener.